We offer for sale with the benefit of NO ONWARD CHAIN this three bedroom mid terrace house. The property is situated on the popular HADRIAN LODGE WEST ESTATE and is accessible to a wide range of local amenities including Redesdale Primary School rated good by Ofsted. The property has a PLEASANT OUTLOOK to the front and is not overlooked, there is a GARAGE at the rear of the property together with SPACE FOR PARKING. 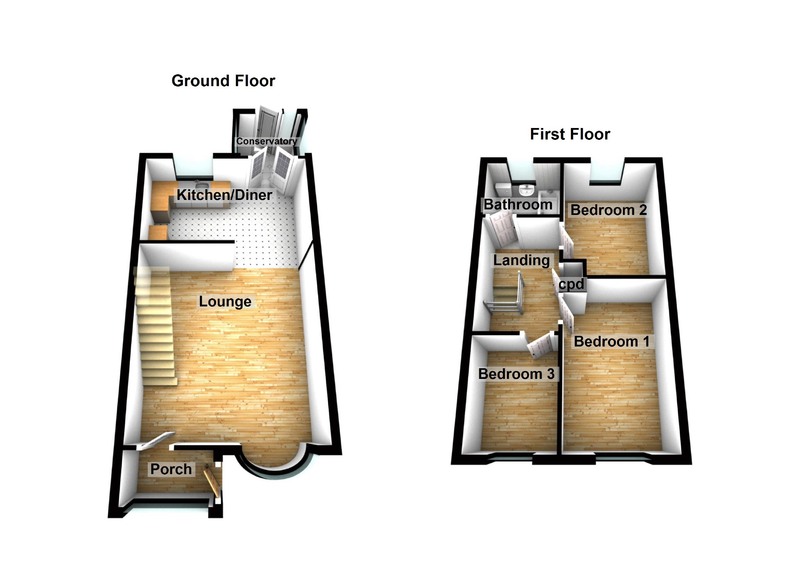 Briefly the home comprises; porch, lounge, kitchen/diner, conservatory, three bedrooms and a bathroom. Additionally there is double glazing, gas central heating and gardens to both the front and rear. This property is being sold with a short lease and can only be sold to CASH BUYERS. Council tax band B. Energy rating TBC. To arrange a viewing call next2buy on 0191 2953322. Entrance Porch - 1.97 x 1.06 (6'6" x 3'6") - Double glazed entrance door, tiling to floor, double glazed window, door to lounge. Lounge - 4.83 x 4.48 (15'10" x 14'8") - Double glazed bow window, radiator, stairs to the first floor landing. Kitchen - 4.47 x 2.60 (14'8" x 8'6") - Fitted with wall and base units with work surfaces over, single drainer sink unit, double glazed window, radiator, double glazed French doors to the conservatory. Landing - Cupboard, access to bedrooms and bathroom. Bedroom 1 - 4.03 x 2.54 (13'3" x 8'4") - Double glazed window, radiator. Bedroom 2 - 2.54 x 3.37 into robe (8'4" x 11'1" into robe) - Double glazed window, built in wardrobe, radiator. Bedroom 3 - 2.60 x 1.80 (8'6" x 5'11") - Double glazed window, radiator, laminate flooring. Bathroom - 1.85 x 1.62 (6'1" x 5'4") - Fitted with a three piece suite comprising; bath with shower over, low level WC, wash hand basin with built under storage. Double glazed window, tiling to walls and floor. External - Externally there is a small gravelled garden to the front, the front is not overlooked. The rear garden is paved for low maintenance and there is a detached garage situated at the property together with space for parking.